This fashionable vintage Men Genuine Leather Double Zipper Coin Pocket Wallet is the perfect gift idea for a male. 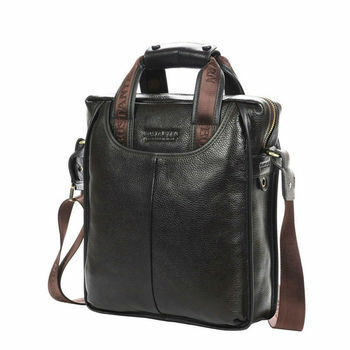 It has a brown exterior made of genuine cowhide leather and a simple design that brings out a stylish look. The interior is designed with polyester and has a coin pocket, photo holder, card holders, interior zipper pocket, and note compartment all of which are secured with a zipper and clasp. Suitable for personal wearing or gift idea for friends or your love one. Note 1: Due to different producing batches,there may be deviation of 1/2″ .2-.5 cm for this items. Note 2: Colors on your computer monitor may differ slightly from actual product colors depending on your monitor settings. Cool wallet! Genuine leather. It's gorgeous. Even the smell of leather. Flat seams and strong. Sturdy zipper, is working properly. Buttons are well and well kept. Many pockets. Gift envelope with thanks, it keychain wood, in the form of bills. Recommend! Purse super. Excellent quality. All the neat and beautiful. Seller recommend. Money of course fit, but such as passport etc. Docks, items come in time. Product description. Good quality, stylish design, delivery for three weeks. I recommend the store and the seller. Thank you very much. Nice wallet. My husband liked. Wallet small, 1000 and 500 the bill with difficulty. Parts of the card is small. The skin does not look like the average quality, do not think that will live a long time. IN general, is not Shipping 2 weeks. Good leather koshelechki. Took the gifts. Track to track. The hot price and coupon get price is about $530. Came in about 2,5 weeks. Ordered three purse, gift to put two key chains, thanks))).